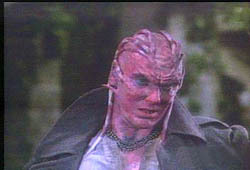 Nightbreed. The mere mention of the name should make you shiver. One of the main characters is played by a director buddy of the director. Which should be a clue that it's not all that good. 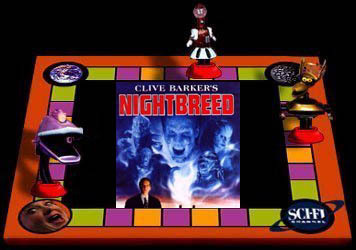 The film really doesn't explain itself all that well, which really is typical of Barker's written words as well. We have a group of freaks and geeks that don't eat chickenheads. Then we have a guy that is in therapy that tells about his dreams killing people, which then happen. Anyway he gets killed, but comes back to life as a freak. It's all very complicated. He ends up fighting some rednecks that are planning on blowing up the cemetery where the freaks live so they can build a giant still. The rednecks are defeated, but the cemetery is blown up pretty good. So it's a happy ending for both sides. John Agar also makes a very special cameo. BEMaven> raimi's shaky cam strikes again. Elroy-L> sign two, focus on a stack of balls. BEMaven> Doc: I like fruit. You like fruit. BEMaven> uh, you don't take the whole bottle at once, guy. Djenk> Don't you hate it when you mix up the acid with the anti-psychotics? BEMaven> oh, yeah. swallowing lithium all at once is VERY healthy. 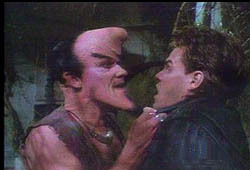 Elroy-L> hey, watch it with that forehead, pokey. BEMaven> we are more than 10 minutes into this, and all i can make out is the hero has some body odor issues. Djenk> Clive confused "not understanding" with "deep loathing"
Elroy-L> recap: so the head shrinker kills the guy who everyone thinks is the killer, but isn't because he's meat for the moonheads? Elroy-L> if the head shrinker is the killer, then what's with the moonheads? Elroy-L> this movie disturbs me. BEMaven> i'm guessing the killer turns out to be James Cameron. Elroy-L> ok, but what about the moonheads? Elroy-L> and their roll in this movie, besides filler, is? 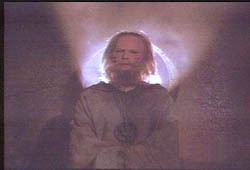 BEMaven> more filler, Elroy...to keep Cronenberg from acting. Elroy-L> oh, so he's "acting" now, is he? Elroy-L> so, he gets the special power of being ugly? BEMaven> so after, what...50 years?...Agar can finally act? Elroy-L> thats a stupid power, she can show people what they already know. 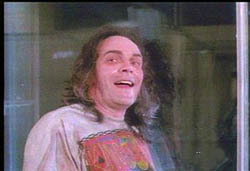 BEMaven> she shrivels at the sight of bad spfx. Elroy-L> so, he wears the mask so he can be known as "Button Eyes"? BEMaven> a cemetary with it's own fun house? Ironf> THESE PIPES ARE CLEAN! BEMaven> yes, Clive Barker has introduced a cunning plot twist: A psychiatrist who is secretly a crazed killer. BEMaven> more importantly...you missed Agar disguised as a xmas tree. Plumm> When did this turn into a Jack Van Impe video? 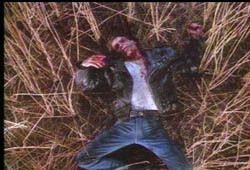 Plumm> On a very special Growing Pains, Carol's drunk driving victim undead boyfriend feeds her too much corpse and poor Carol goes bulimic. Ironf> ohh a Shatner dropkick! 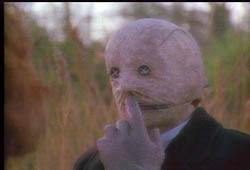 BEMaven> BTW, I have the Cliff Notes for 'Nightbreed'. All ten volumes. Djenk> Ladies and Gentlemen, Your 98 Medina Monsters!!! Plumm> What card did my sucking chest wound pick? Guess! Plumm> so, it was a movie and now it's over. "I can smell innocense at 50 yards." "Miss Winston...everyone has a secret face." "Do you want a drink...I want a drink." "Aaron Boon...the tribes of Moon embrace you." "The child has no life to save." "Y'all come back now, ya hear." "I was born to destroy them." "Shangri-La on dope. We love it"
Please let us take this time to reflect upon the career of John Agar, an MST3K favorite. John Agar was born to a meat packer in Chicago, the eldest of four. In 1945 he took a chance and got hitched to Shirley Temple, which put him in the public eye and allowed him to get into the acting biz. Agar debuted opposite John Wayne, Henry Fonda and Temple in John Ford's FORT APACHE. After for years of violent domestic disputes, his marriage to Shirley Temple ended in 1949. But his movie career, such as it was, continued. Popular with fans of Westerns and sci-fi flicks, Agar is a staple at film conventions and autograph shows.